SRL will be performing several events in conjunction with Web98 Design and Development Conference and Exposition to be held in Moscone Center 22-24 June 1998. Most up to date and authoratative information about any upcoming SRL show will appear first on this WWW site. To avoid regulatory difficulties, we cannot answer e-mail or phone calls regarding upcoming shows until we are ready. Please check back with this site for the most recent information. Do *NOT* contact SRL or SRL people about information, location, tickets, etc. Information will appear on this www site when it can be disclosed. 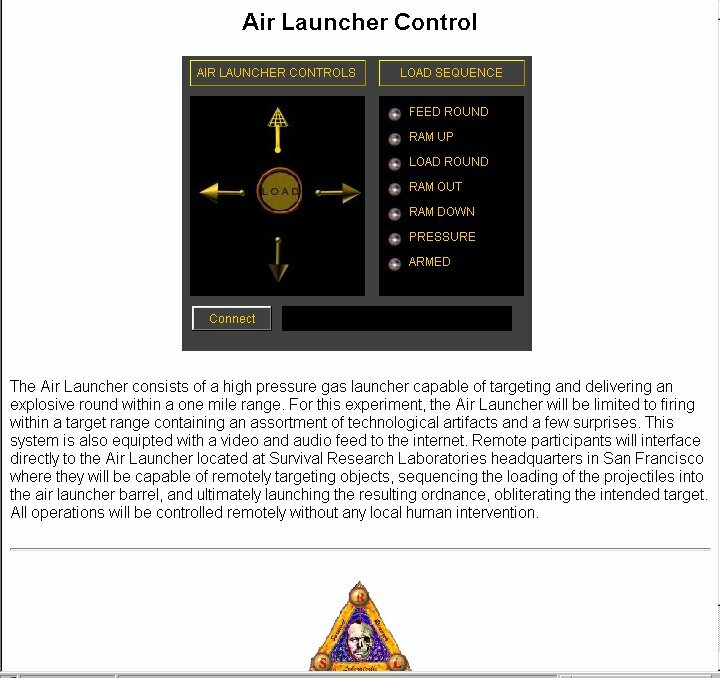 A disabled version of the control panel can be found here. It requires Netcape Communicator 4.04 or higher or Microsoft Internet Explorer 4.0 with updated Java VMs (v1.1). Anonymous tele-operation of SRL machinery near the location shown in San Francisco around noon. During this event, anonymous participants at Moscone Center will establish a direct control link using publicly available software over the internet to several SRL machines located at the undisclosed location in San Francisco. The disabled version of the system can be previewed here. It requires a VRML browser and a Java 1.1 capable web browser (Netscape Communicator 4.0/Microsoft Internet Explorer 4.0). The actual event lasted 15 minutes. The Boeing and Epileptic Bot were placed on a flatbed truck at the 3rd St. end of South Park. After the Bot was flailed and torched by the Boeing, the truck took off just in time for the police and fire dept responding to a call, to arrive at a scene of people randomly milling around an empty space in the shape of a flatbed truck. Images of the event courtesy of Gabriella Marks. 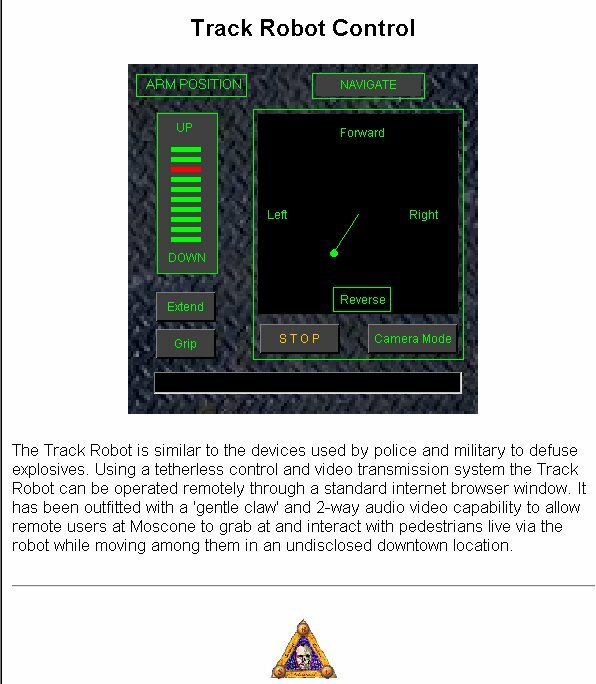 Anonymous tele-operation of the mobile SRL Track Robot to be located at a yet to be disclosed downtown area of San Francisco around 2pm. During this event, anonymous participants at Moscone Center will establish a direct control link using publicly available software over the internet to the SRL machine elsewhere in San Francisco. A disabled version of Track Robot controls can be found here. It requires a Java 1.1 capable web browser. Please check this site for the most recent and up to date information about these events.